You will earn 1,387 Reward Points. Earn 1 reward point for every 1 dollar spent. 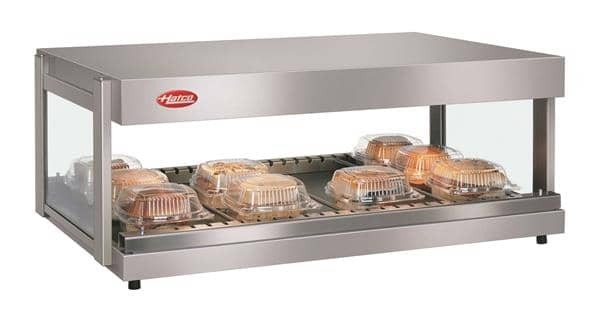 Hatco's Glo-Ray® Horizontal Merchandising Display Warmers are designed specifically to hold hot wrapped or boxed product safely, and at proper serving temperatures. With pre-focused infrared top heat and a thermostatically-controlled hardcoated heated base, they excel at extending the holding times of most food, offering the convenience of self-serve and the efficiency of kitchen-to-server holding. Glo-Ray® Horizontal Merchandising Warmer - The Merchandising Warmer shall be a Glo-Ray® Model ... as manufactured by the Hatco Corporation, Milwaukee, WI 53234 U.S.A. The warmer shall be rated at ... watts, ... volts, and be ... inches (millimeters) in overall width. It shall consist of a thermostatically-controlled, hardcoated heated base, infrared heat from above, full view tempered glass sides, adjustable divider rods, and incandescent display lights. The infrared heating element shall be tubular metal sheathed and the warmer shall have a cord with plug attached. Accessories shall include flip-up doors, 4" (102 mm) legs, and additional stainless steel dividers rods. Warranty consists of 24/7 parts and service assistance (US and Canada only).